1 Why choose a tower fan heater and cooler? It can be pretty difficult searching for fans or heaters for the home. Which one will last the longest; should I buy cheap or expensive? And when it comes to tower fans that have both hot and cold options, well let’s say; you might need to do a bit of research to get something that suits just you. We also all know how weather can change, one minute you can have sweltering hot weather and on another day chilled cool breezes come blowing in; and working and playing in extreme temperatures can affect our health, our emotional wellbeing and our rate and pace of getting things done. Why choose a tower fan heater and cooler? There are different types of tower heaters and coolers on the market to review, and the reason it’s a good idea to consider the tower-types is that they are an excellent choice if you want to increase the air circulation around the house, affordable. The top of the range combined fans and heaters have the capacity to cool you down quickly because the air flow is so much superior to what an air conditioner or a swamp-cooler would provide. Another good reason is that they have been specifically designed to take up a little bit of space. Being tall and sleek, they fit into places where nothing else would really go. Generally, they stand from 2-4 feet high from the floor, but you can even let them stand on other furniture if it’s sturdy enough. Some of these heater cooler fans make such a little noise that you forget they are on. But you wouldn’t want to hide them in any old corner anyway, even though they are so compact; because they are so attractive to look at, they kind of contribute and enhance the other décor of your home very attractively. The combination appliances which come with both heater and cooler facilities are able to cope well with the double-duty – they offer warmth and comfort on cold days and fresh and cool air flowing in the hot days. Purchasing tower fans that offer both the heating and the cooling functions has definite appeal, the chief reason is the budget, but also the storage. It is often cheaper to buy one appliance that is multi-functional. It’s as the name says; fit for all seasons! This comfort tower offers you cooling, heating and humidifying from a very attractive tower. With its four functions of evaporating cooler, high-velocity fan, ultrasonic humidifier and infrared heater, what you get is a portable supplier of comfortable air management for any room in the home. Your Life Smart will run for about 10 hours on a tank (one gallon) of water when you are using it in the cooling mode. The infrared heating system, with its two heat settings, gives you warm, soft and even heat distribution. The humidifier keeps the humidity levels maintained, working in tandem with both the heating and cooling systems. It can also be used independently. With both heating and cooling available on this tall and sleek fan heater, reviewers said they loved the look of it. “Easy on the eyes”, they say. It’s excellent at warming up medium-sized rooms, taking full marks for its energy-efficient spot heating for full-room heating. There are no fast-spinning blades on this appliance or heating elements that are visible making it safe with children or pets around. It switches off when it has been accidentally knocked over and is easy to clean. Maintains the targeted temperature as you sleep. Cons: Reviewers say it’s more effective as a heater than a fan. This attractive heater cooler combination has one big advantage and that’s the unique circular design. It means you get even, effective and constant air flow making this one of the reasons it’s a popular buy. With its curvaceous style, the air is expelled out at a wide angle, reaching across an entire room. It doesn’t hit you with a brief surge of air as some of the oscillating ones do. It comes with a generous 5-year guarantee. Cons: Reviewers say the fan seems louder than some other makes. Fan mode only has one speed. A very popular space-saving tower heater cooler design and quietly and elegantly keeping your home cool or warm. The heater comes with Eco-Smart settings which means you save on your heating bills. There are easy to use controls, a thermostat that is programmable including remote control – so easy to change temperatures from your sofa or bed. It’s ideal for larger rooms. It has the fan mode when the weather starts heating up. Cons: Reviewers say the fan only has one speed. A ceramic tower heater, it comes with 2 heat settings, the 900-Watt and the 1500-Watt. It has a thermostat range of 59-degree F-95 degree F.
It’s an oscillating heater, which means you get wide, even heat distribution. It has a 9-hour timer so you can set the heater to suit your times and needs. If it tips over, it cuts out – an overheating protection feature as well which automatically resets for safer usage. It has a remote control for the heater so that you can change temperatures conveniently from a distance. Ideal for your home, office, caravan or conservatory. Cons: Filter cannot be removed. Are the above fans not what you are looking for? Be sure to look for ‘Tower heaters’ and search through the results. Most of the time, tower heaters will have a ‘fan only’ option which you can use in summer. The fan is also utilized in winter to push warm air out into the room. 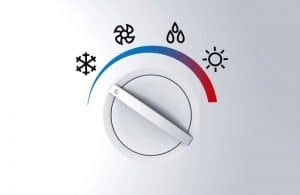 The only problem with these kinds of units is that generally you do not get as many customizations and options for the summer months as those units are primarily focused on heating in winter. It’s really all about what suits your needs, but you can do your own research and seek out the one that will press all your buttons. No need for you to blow hot and cold when it comes to finding the right house-ware products for your home. You can find exactly what you want from the above. Have you tried any of these models, or have experience with a tower heater/cooler? Let us know by commenting below!